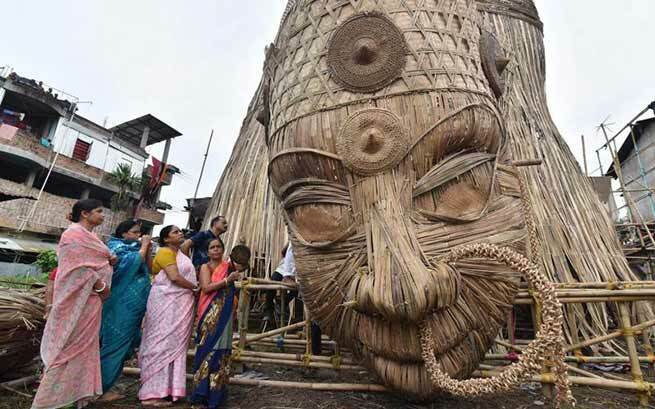 A Muslim artist Nuruddin Ahmad along with his 40 member team, is designing world’s tallest 110-feet tall idol of Goddess Durga, carved out of bamboo sticks. Claiming it to be the world’s tallest bamboo sculpture, Bishnupur Durga Puja Committee has registered it in the “Guinness Book World Records”. He further informed that at least 5000 bamboo poles have been used in the making of the idol. According to Project supervisor Deep Ahmed , “The work started two months back. And the height was approximately 110. But all of a sudden on 17th of this month, the image fell down because of the strong cyclone here in Guwahati. Fortunately, no was injured in the incident, but re-erected again within just six days. Organisers are in touch with the officials of the Guinness Book of World Records and Limca Book of Records. Two government officers have been appointed as adjudicators. Besides, the organising committee will have to compile a video of the structure with necessary formalities and send it to the authorities for recognition. The four-day Durga Puja celebrations will begin on September 27.